There may come a time in your life when you need to invest in the services of a housekeeping company. This could be due to illness, lack of time to complete certain jobs properly or when you just need a helping hand with young children or elderly relatives. 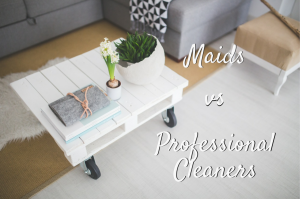 Choosing the best form of assistance is easier when you understand the differences between a professional cleaner and a maid. A maid or domestic worker is a person who works within your household to perform a range of household services either just for you or for your family. Cleaning and household maintenance will be included in their responsibilities as will cooking, doing the laundry and ironing. Shopping and household errands will be undertaken and the job may require them to live with you as well. This will obviously depend on the nature of the work, particularly if child care is on the agenda. The responsibilities of a maid will always need to meet health and safety standards whether related to cleaning, removing waste, purchasing groceries or caring for children or the elderly. Duties here would include providing companionship as well as helping with dressing, bathing, eating and any other needs. Depending on your requirements, the maids can also be asked to take care of pets by grooming, exercising and feeding them. Answering telephones and the door to repair workers and accepting deliveries would also be expected. An experienced maid would know the principles and processes for providing personal services and meet quality standards for your satisfaction. On the other hand, a professional cleaner is sent to you to perform all the cleaning tasks requested to the highest possible standards. The tasks include dusting furniture, deep carpet cleaning, sweeping, mopping, vacuuming, and cleaning and disinfecting all relevant bathroom and kitchen areas. Depending on your needs, the service can be used regularly on a weekly, fortnightly or monthly basis or for a one-off deep clean. A reputable company such as Cleaning Smyrna would ensure that the cleaners sent to you were vetted, trained and insured. All safety policies and procedures would be conformed to and your cleaners would pay extra attention to your special requests. This service is provided by friendly cleaning specialists who can work within a team or alone to get the cleaning done. Your house would be thoroughly cleaned from top to bottom and rubbish would be emptied and recyclables put into disposal areas for collection. Cleaning checklists would be used to ensure all cleaning needs are met. You may find that if you use the professional cleaners on a regular basis you’ll be able to get better deals and discounts.